When you hear the familiar harmony of the world-famous Dapper Dans, you instantly know you’re at a Disney Park on Main Street, U.S.A., right? 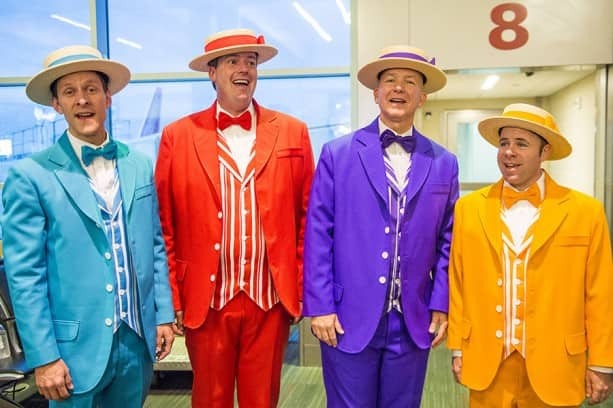 That’s why if you were in Dallas’ Love Field early Monday morning, you might have been puzzled to hear the barbershop quartet’s tunes echoing through the airport terminal. Walt Disney World Resort joined with Southwest Airlines to help celebrate the addition of the airline’s first non-stop route from Dallas’ Love Field to Orlando International Airport. Prior to boarding, passengers were able to commemorate the flight by posing in front of backdrop of Cinderella Castle that served as a “Disney Side” family photo opportunity. Aboard Flight #887, passengers listened as Jungle Cruise Skipper “Jungle Jane” made flight announcements in the attraction’s famous style of humor. (And it is true: when the plane flew through a passing shower, passengers saw the backside of water.) Mouse Ears and Mickey Mouse-shaped treats were given to passengers, as well as complimentary tickets to Mickey’s Not-So-Scary Halloween Party that evening in the Magic Kingdom. As the plane continued to Orlando International Airport, The Dapper Dans roamed the aisle of the airplane, providing one-of-a-kind, in-flight entertainment. 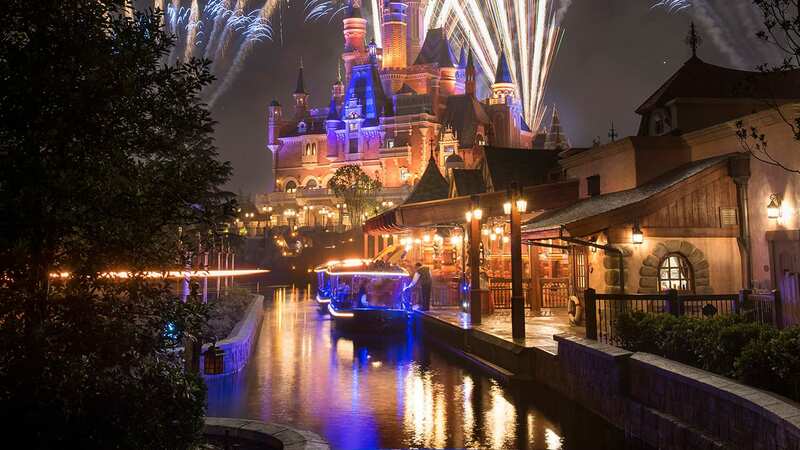 Take a look at this gallery of photos provided by Disney Parks photographer Ryan Wendler, as well as this video with host John Graham. Gary, if I had been on that flight, I would have been a blubbery, happy mess from take-off to landing…..That was such an awesome surprise and great way to showcase the Disney Side! That would be the first time a plane load of people would wish for a delay on the runway so that the fun would continue!! How exciting for them! Any chance we could see a few Disney themed Livery on Southwest planes? The gentleman biting into his treat looked like ESPN Anchor Jay Harris. Loved the video though! BEST. FLIGHT. EVER. What I would have given to be on board that plane! Disney, you never cease to amaze me with your magic and memory making! This was absolutely magical in every way! I had to do a double take and watch the video again because I thought I recognized the Dapper Dan in purple. It’s Dirk!!! I am in the Candlelight Processional Cast Choir and he is sometimes one of the vocal directors. He is wonderful to work with and an amazing vocalist. Thank you so much for sharing this. It certainly brightened my day! What a magical journey for these passengers! It warms my heart to know you all did that. Thanks for sharing! Maybe this can be an everyday affair on flights to Orlando? Ha! If we did this every day, I think I would move out of Central Florida just so I could make it my daily commute to work! Thanks for reading and watching. I can only imagine how wonderful and entertaining this must have been for the passengers. What a truly magical event! Happiest Flight On Earth (and above it)! Is that Adam Rucker from YouTube? : ) What a great flight- you can fly- you can fly- you can fly! Dapper Dans are the best barbershop quartet. I agree, Melissa. And yes, Adam was a wonderful host aboard the plane and we always love working with him!